Leah Hogsten | Tribune file photo Sean Kendall pets the dauschound of a fellow supporter at a protest rally in June as the sign holding marchers pass by. 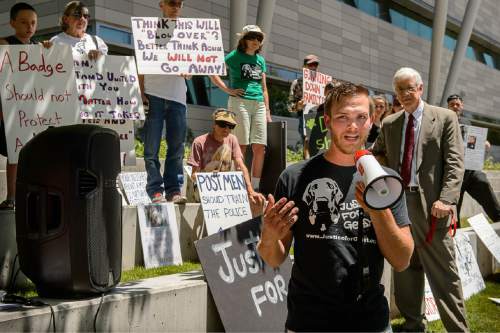 Hundreds of supporters of Kendall and his dog, Geist, who was shot and killed in his backyard by a Salt Lake City police officer during a search for a missing child, rallied at the SLC Police headquarters to protest the officer's action. 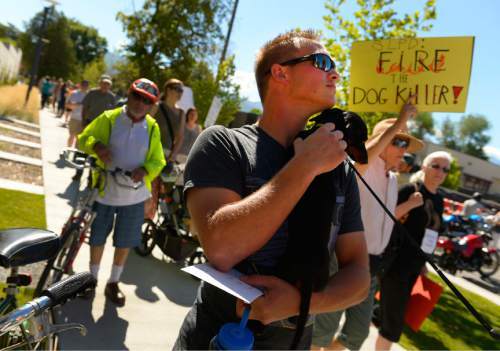 Trent Nelson | The Salt Lake Tribune Sean Kendall speaks as twenty people and a few pets ralliy outside Salt Lake City police headquarters on Thursday who sympathize with dog owner Kendall and are calling for accountability from the department and the officer who fatally shot Kendall's Weimaraner one year ago. Geist. 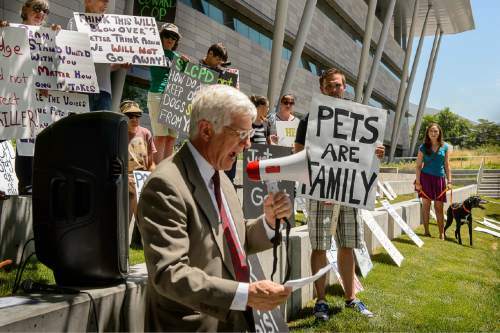 (Justice for Geist Facebook page) Trent Nelson | The Salt Lake Tribune Attorney Rocky Anderson speaks as twenty people and a few pets rally outside Salt Lake City police headquarters , Thursday June 18, 2015, sympathizing with dog owner Sean Kendall and calling for accountability from the department and the officer who fatally shot Kendall's Weimaraner one year ago. The owner of Geist, a dog shot to death in 2014 by a Salt Lake City police officer, has filed a civil-rights lawsuit against the city and five of its officers, demanding roughly $2 million for the loss of his four-legged companion. Filed Friday in Salt Lake City&apos;s 3rd District Court, the lawsuit from dog owner Sean Kendall contends police were not trained to deal with dogs and says the officer who shot Geist violated his 4th and 5th Amendment rights against illegal search and seizure and due process when entering Kendall&apos;s yard without sufficient cause. "Kendall loved and cared for Geist as a best friend," his attorney, former Salt Lake City Mayor Rocky Anderson, wrote in court papers. "Geist was robbed of the vast majority of his life, and Kendall was robbed of Geist&apos;s continued life with him, which cannot be replaced any more than a child or a family member can be replaced." The lawsuit seeks a jury trial and demands a minimum of $2 million in punitive damages for the alleged violation of Kendall&apos;s constitutional rights, loss and destruction of his property, pain and suffering, emotional trauma, loss of income and loss of companionship. Named as defendants in the lawsuit are Salt Lake City Corp. and police officers Brett Olsen, Brian Purvis, Joseph Allen Everett, Tom Edmundson and George S. Pregman. A representative for the city said officials do not comment on pending litigation. Olsen is the officer who shot Geist, and Purvis was the "watch commander" supervising the officers on the day of shooting. No hearings are set in the case. Geist was shot June 18, 2014, when Olsen entered Kendall&apos;s fenced Sugar House backyard during a neighborhood search for a missing 3-year-old boy. Geist, a 2-year-old dog that weighed about 100 pounds, reacted by barking and running toward Olsen, who shot him. A review by the city&apos;s Police Civilian Review Board said Olsen did not violate any department policies. The fatal shooting sparked public outcry, including demonstrations outside the police department and resident complaints at City Council meetings. Kendall previously turned down a $10,000 settlement offer from the city, saying he wanted justice and a change in police policy related to use of force against dogs. In court papers, Kendall says police conducted an illegal search of his yard and should not have entered the property without a warrant. The lawsuit says officers also failed to meet the "exigent circumstances" standard  a reasonable belief of a connection between Kendall&apos;s residence and the missing boy  necessary to perform a warrantless search. Olsen also should have determined whether a dog was present and whether that animal posed any potential threat before entering the yard, but he was not trained to do either, the lawsuit states. Officers also are not trained how to avoid the use of lethal force against a dog, court papers say. "The idea that Geist would ever harm anyone entering his yard is absurd to anyone who knows Geist or who is knowledgeable about his breed," the lawsuit states. 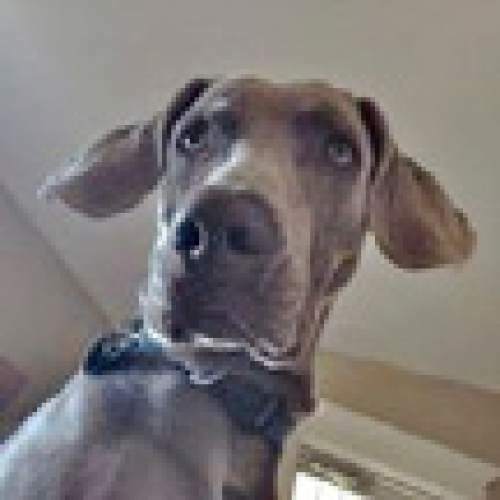 "A loudly barking Weimaraner, running toward someone unknown in a backyard, cannot reasonably be said by anyone with the least amount of training, study or experience to constitute a reasonable threat of injury, let alone serious injury." According to the Civilian Review Board report, however, Olsen described Geist&apos;s bark as "angry" and said the dog charged at him. Olsen told the board he considered using a stun gun but feared it would not be effective and that he feared being bitten or suffering serious injury. "I have been around a lot of dogs," Olsen states in the board report. "… This one was coming with a purpose." Kendall&apos;s lawsuit also claims that the review board&apos;s administrator failed to provide the board with accurate information about the "exigent circumstances" standards required to perform a warrantless search, therefore allowing the board to "erroneously" rule that Olsen&apos;s actions were justified.